Food shopping is never simple. We weave through the aisles bickering about sell by dates and yogurt brands. Fight at the checkout about whose turn it is to pack/pay. Then arrive home with half the essentials missing. This week it was different. As I turned the herb corner, I spotted bags of new Indian ingredients in my local supermarket. Curry leaves? Okra? Aisle 2? Eternal bliss! A silly smile crept on my face and stayed on. Despite the promotional 24-pack beer carton and ready-roasted battery chicken portion being loaded by the man into the trolley. I entrusted the man with acquiring a bag of fresh frozen grated coconut from the Chinese store by his gym. He brought back fresh frozen shredded coconut instead. Wash the okra in a colander under a cold water tap and leave to dry. This will get rid of the slime inside. I just left it by the cooker for 15 minutes. When it’s dry, slice off the tip and the ends and cut each one into 1.5 cm pieces. In a wok or large frying pan, heat two tablespoons of oil over a high flame. When it is hot, stir in the sliced okra and all the powders apart from the garam masala. Stir fry for five minutes taking care not to break the okra. Then mix in the remaining oil and coconut, salt to your taste and fry for another two minutes until the spices are mixed through. Now lower the flame to medium, add about three to four tablespoons of hot water, cover and cook for about five to 10 minutes until the grated coconut has softened. If the water dries up early just add two tablespoons more at a time. Finally mix in the garam masala, salt and serve hot as a side dish with curry. quick and simple 🙂 i posted an okra recipe recently too. How lovely to get okra from your supermarket. And beautiful looking recipe Mallika. It is exciting to get Indian groceries at the regular supermarket! 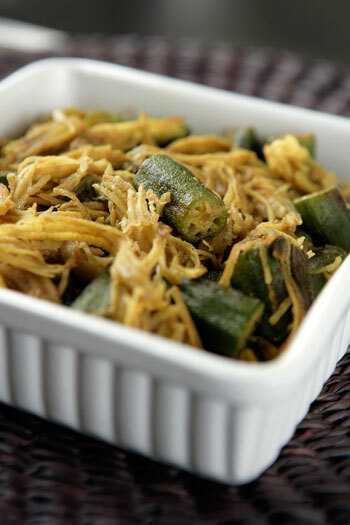 I love the combination of coconut and bhindi. Never eaten it before but it sounds so delicious. Is it a traditional recipe or one that you conjured up? Wow! This is the second post I have read about okra today! Okra must be the new something or other!